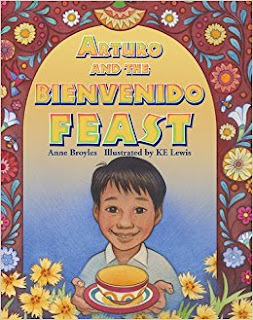 ARTURO AND THE BEINVENIDO FEAST by Anne Broyles is a delightful, heart-warming bilingual children’s book about family, love and bienvenida / welcome. In this new book, Arturo and his grandmother, Abue Rosa, are preparing a feast to welcome his aunt’s fiancé to the family. However, when Abue Rosa doesn’t feel well and must lay down, Arturo doesn’t want to disturb her and so he takes over the menu with delicious results. As the author states: Food is one of the ways families share love. Readers will love Arturo’s generous heart and innocent independence. They’ll also appreciate the warm and colorful illustrations by KE Lewis, and the simple recipes that complete the story. We whole-heartedly enjoyed this book and were pleased to share it with our small nephews, who wanted to duplicate Arturo’s final menu! Other books in this series: ARTURO AND THE NAVIDAD BIRDS. ABOUT THE AUTHOR: Anne Broyles writes books and curricula for children and young adults. Her first book with Pelican, ARTURO AND THE NAVIDAD BIRDS, received the International Latino Book Award second place for Best Children’s Picture Book-Bilingual. Other books have been named Notable Social Studies Trade Books for Young People and Bank Street College’s Best Children’s Books of the Year and have won other awards. Visit her at www.annebroyles.com. ABOUT THE ILLUSTRATOR: KE Lewis is the resident cartoonist for Cobblestone magazine and an animator for Dig It!, an education program in Seattle, WA. She is a member of the Society of Children’s Book Writers and Illustrators and the Puget Sound Beekeepers Association. Visit her at www.karenlewis.com. Multicultural Children’s Book Day 2018, (1/27/18) is in its 5th year and was founded by Valarie Budayr from Jump Into A Book and Mia Wenjen from PragmaticMom. Our mission is to raise awareness of the ongoing need to include kids’ books that celebrate diversity in home and school bookshelves while also working diligently to get more of these types of books into the hands of young readers, parents and educators.